Dogs have been used in wars since back in the day. Their jobs have varied over the years, from being trained to track with their acute sense of smell, to bringing down infantry or even horses by biting into the hamstrings of their targets. The history of war dogs is long and detailed. In ancient times, they disrupted battle lines and frightened soldiers. They were not rendered useless as the ages drew on, however. Stubby, a war dog of World War I, was promoted to the rank of sergeant. Chips, a German Shepherd mix, and Smoky, a Yorkshire Terrier, were honoured for service in World War II. War Dog Memorial at Wildlife Prairie State Park in Peoria, Illinois. The Molossian 'Canis Molossus' dog of Epirus was the strongest known to the Romans, which were specifically trained for battle by the military. However, when fought against the broad-mouthed, powerful Mastiff called Pugnaces Britanniae they were out matched. The Romans exported many of this breed of Mastiff to Rome and then disseminated them over the known world. Dogs have been used in war for a very long time. Some ancient civilisations that used war dogs included the Egyptians, the Greeks, the Ancient Britons and the Romans. Often war dogs would be sent into battle with large protective metal collars from which spikes and curved knives protruded at all angles and wearing coats of chain mail. Romans had attack formations made entirely of dogs. These proved to be effective machines of war at the time. Native Americans also used dogs, though not on this scale. Dogs were also used for military purpose during the Middle Ages. Atilla the Hun used giant Molossian dogs in his campaigns. Other civilisations used armoured dogs to defend caravans or attack enemies. Spaniards used dogs when they invaded the land controlled by South American natives. The British used dogs when they attacked the Irish. War dog breeding became highly valued. Gifts of wardog breeding stock between European royalty were seen as suitable tokens for exchange throughout the Middle Ages. Wardogs were used by England against the Gaels in Ireland and by many European forces, such as Spanish Conquistadors, in the New World. Later on, Frederick the Great used dogs as messengers during the Seven Years' War in Russia. Napoleon would also use dogs during his campaigns. Dogs were also used up until 1770 to guard naval installations in France. The first official use of dogs for military purposes in the United States was during the Seminole Wars. Dogs were used in the American Civil War to protect, send messages, and as mascots. In ancient times, dogs, usually large ancient mastiff and rottweiler-type breeds, would be strapped with armor and spiked collars, and sent into battle to attack the enemy. This strategy was used by various civilisations, such as the Romans and the Greeks. This approach has been largely abandoned in modern day militaries due to the fact that modern weapons would allow the dogs to be destroyed almost immediately, as on Okinawa when US soldiers quickly eliminated a platoon of Japanese soldiers and their dogs. Ethics questions have also been raised about the uses of dogs in this way. One of the most famous war dogs was Rags, the mascot of the 1st Infantry Division. Rags achieved great notoriety and achieved celebrity war dog fame, after saving many lives in the crucial Meuse-Argonne Campaign by delivering a vital message despite being bombed and gassed and partially blinded. As warfare has progressed, the purposes of dogs in war has changed greatly. The War Dogs' contemporary is now more commonly referred to as a Police dog, or in the United States as a Military Working Dog (MWD), or K-9. Their roles are nearly as varied as their ancient cousins, albeit are no longer used in front-line formations. Traditionally the most common breed for these operations has been the German Shepard, although in recent years there has been a shift to smaller dogs with keener senses of smell for detection work, and more resilient breeds for patrolling and law enforcement. The use of War Dogs on prisoners by the United States in the context of its recent wars in Afghanistan and Iraq has been very controversial. All Military Working Dogs in use today are paired with a single individual after their training. This person is called a handler. While a handler usually won't stay with one dog for the length of either's career, usually a handler will stay partnered to a dog for at least a year, sometimes much longer. In the 70's the Air Force used over 1,600 dogs worldwide. Today, personnel cutbacks have reduced USAF dog teams to approximately 530, stationed throughout the world. As a partner, few humans can match the versatility and loyalty of a dog. Military Working Dogs are perhaps at their most valuable when they are trained to detect explosives. Just as with narcotics, trained MWD's can detect minuscule amounts of a wide range of explosives, making them an invaluable addition both to entry points and patrolling within secure installations. Marine Corporal Dustin Lee and his German shepherd, Lex, scoured Iraq for roadside bombs together, and slept next to each other every night. When a mortar attack killed the 20-year-old Marine in Fallujah a few months later, Lex, whimpering from his own injuries, still had to be pulled away from Dustin's body. That strong bond compelled the slain Marine's family to adopt 8-year-old Lex even though the military said he still had two years of service left. The family lobbied the military for months, enlisting the aid of a North Carolina congressman who took their case straight to the Marine Corps' top general. On Wednesday, the Marine Corps finally announced Lex could go home to Lee's family. It is the first time the military has granted a war dog early retirement to be adopted by someone other than a former handler. Lee's family is from Mississippi and will pick up Lex from an army base in Georgia today, exactly nine months after their son was killed in combat. Though some shrapnel remains lodged in his back, Lex the dog has otherwise recovered from his wounds and has been serving alongside military policemen at Georgia base since July. Officials at Lackland Air Force Base in San Antonio, Texas which trains dogs for all service branches, confirmed it is in fact the first case of its kind. Dustin Lee joined the Marines after graduating from high school in 2004. His father said his drive to become a dog handler came from Lee's mother, who worked with search-and-rescue dogs for their local emergency management agency when Lee was a kid. 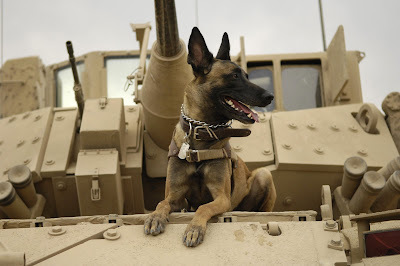 The military has more than 1,700 war dogs that work alongside American troops, including about 260 in the Marines. Their bomb-sniffing skills have been in high demand in Iraq and Afghanistan. North Carolina congressman Walter Jones said he discussed the case with General Conway, the Marine Corps commandant who gave the green light to Lex. And that's about as emotional as the army will get. Tugs at the ole holiday heartstrings, no?